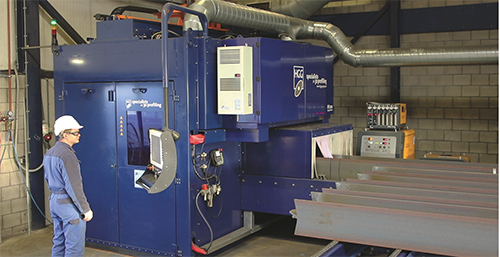 HGG Profiling Equipment, Charleston, SC, a specialist in 3D profiling, debuts the RPC 2.0 robotic profile-cutting line, able to cut both bolted and welded connections. It performs tasks from 3D profiling to beam coping, including cutting I/H beams and square/rectangular tubing profiles. Also known as a plasma-beam profiler, the RPC 2.0, according to company officials, increases accuracy, quality and overall productivity with technology innovations that eliminate time-consuming machine tactility. The machine incorporates HGG’s laser-beam-measurement vision system, automatically scanning beams for common imperfections, including flanges that are not always perfectly straight and bodies that are off-center and/or twisted. The result is high accuracy. HGG’s electronic measuring devices compare the actual outside shape and position dimensions of the raw material to the cutting program, automatically compensating for any deviation on the fly without interrupting material preparation or profile cutting time. Along with improved quality profiles and faster cutting, overall productivity reportedly is improved because less grinding is required after parts are cut. The RPC 2.0 line includes dedicated HGG software for programming and work preparation, an in-feed roller conveyor and out-feed roller conveyor for efficient material handling, a cutting and marking cell with integrated downdraft table, a robotic plasma profile cutter for precision cutting, a touchscreen operator interface with built-in macro shapes, and a laser vision system.